lowlands and lower parts of mountains. The Rewarewa grows up to 30 metres tall, with a trunk up to 1 metre in diameter. 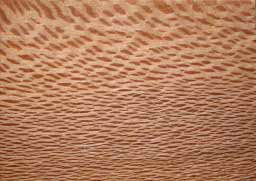 The wood is attractive, with grain similar to plane or honeysuckle. 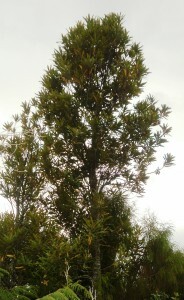 “the bucket of water tree” (because the wood is too wet to use for firewood), or the New Zealand bottlebrush. The tree’s flowers are in spiky dark red velvet brushes of many flowers (with up to 80 flowers) that open with four narrow petals at the base and a yellow pistil sticking out. Rewarewa flowers are quite sweet smelling, and birds such as tuis and bellbirds are attracted by the nectar. The fruit is a woody capsule that splits open to release winged seeds that spin to the ground. Mäori suggest that the rewarewa seedpod is the model for Mäori canoes, right down to the figurehead. The inner part of rewarewa bark was used by Mäori to bandage wounds to reduce bleeding and promote healing, but the wood was not much used. Rewarewa is hard to dry with severe distortion (considerable tangential shrinkage) and cracking, but when dry it is heavy, hard and very wearresistant. It should be worked with the grain, and can be planed, turned and sanded with ease, although it has a tendency to tear and does not hold a good edge. instruments, and is also often used for hand-tool handles. It is difficult to season without cracking distortion and tends to move after turning. It tends to be tricky to work and challenging to the turner, but takes a good finish. Possible health risks: none known.